UMP | University of Minnesota Press Blog: PW's homepage: Look familiar? We are filing this under "Cool Thing We Like Today": Publishers Weekly's homepage today includes a photo-link to its Spring 2011 title announcements ... and we couldn't help noticing the similarities between this image and our Fall 2010 catalog cover. Very cool. 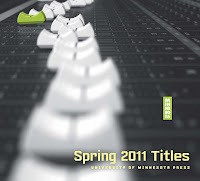 We thought we'd take the opportunity to point you toward our recently released Spring 2011 catalog (PDF) of forthcoming titles. Who knows *where* this image might pop up in the months to follow, eh? We kid. And as if this weren't cool enough for you, there's more. Featured on Page 4 of the Spring 2011 catalog, you'll find David Monteyne's Fallout Shelter: Designing for Civil Defense in the Cold War, which was not only featured within PW's Spring '11 title announcements, but whose cover leads the story. Very, very cool. They totally stole their design from the Fall 2010 catalog! At the very least, they should give a credit to the Press.